Last night people were met with heavy rains in Islamabad and Rawalpindi. The rains managed to cool down the temperature in the twin cities, however it also caused a lot of problems for the residents as well. In Rawalpindi, the Lai Nullah has risen by 17 feet, flooding the surrounding, low lying areas near it. Dhok Kashmirian and Dhok Kala Khan are two of the many localities that have been severely affected by the rains. Low lying areas were not the only ones to get affected as reports say that the flood water has also entered Benazir Bhutto International Airport where passengers are facing immense difficulties. Authorities have so far failed to speed up the process of draining water from inside the airport. Reportedly, the luggage of passengers at the airport has also gotten wet as there were no proper arrangements for such a situation. Rain water has also flooded areas of the Airport Road, Rawal Road and other nearby areas. 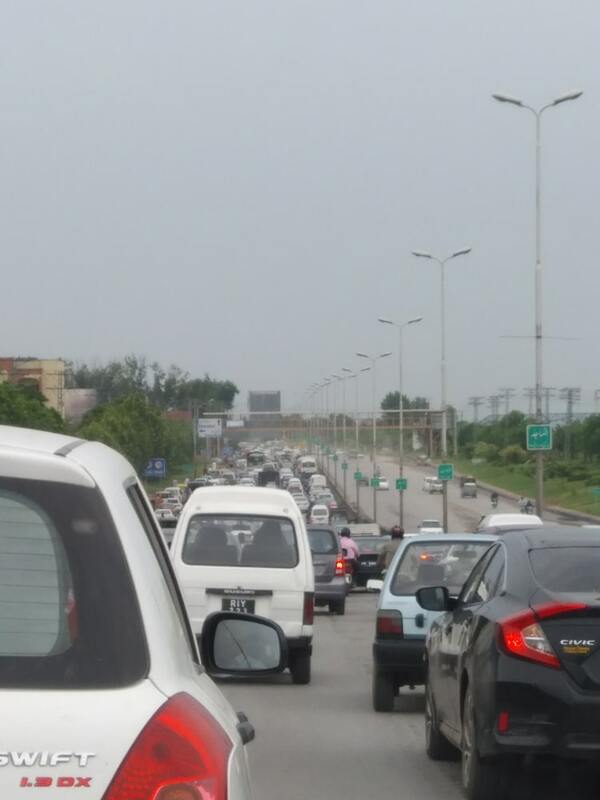 Traffic was stuck in the early hours of the morning and the whole Airport road was blocked. Traffic jam as shown on Google Maps. People are advised to check their routes for any unusual traffic jams before heading out to work or any other place in order to avoid becoming stuck. Police wardens say that only once the flood water is either drained or dried out, will the traffic start moving again at a normal pace. According to the Pakistan Meteorological Department (PMD), Rawalpindi received 72mm of rain whereas Islamabad received 56mm, flooding several homes and roads alike. The relevant authorities have implemented an emergency plan to drain out accumulated water in low-lying localities. The water is being removed via water sucking vehicles, de-watering pumps and jets. Trees, street signs and walls at many places either fell down or were damaged. Thankfully, no loss of human lives has been reported due to last night’s rains. What a load of BS, my dad landed at BBIA this morning and I’ll arrive there tomorrow morning, he hasn’t complained of any ‘floods’ and his baggage did not get wet either. Geo News is their source. Not surprising. There is big rut on the road to Islamabad airport right before Islamabad Flying Club which causes flood on the road. can you tell me when you went to the airport? i was there too around 8:30am and took more than an hour to get past the airport from the flyover. police said it was because of water in airport and road. I wasn’t there. My father’s flight arrived at 8:20 AM, the tarmac and runway were wet, however the baggage was not affected, nor was the immigration hall. The internet for some reason went down due to this so called ‘flood’ causing immigration and check-in to be ridiculously slow. is it traffic jam (google maps image)!! The real traffic jam is in Karachi. just cant go home from Port Qasim from any route. Did i say that i follow google maps??? 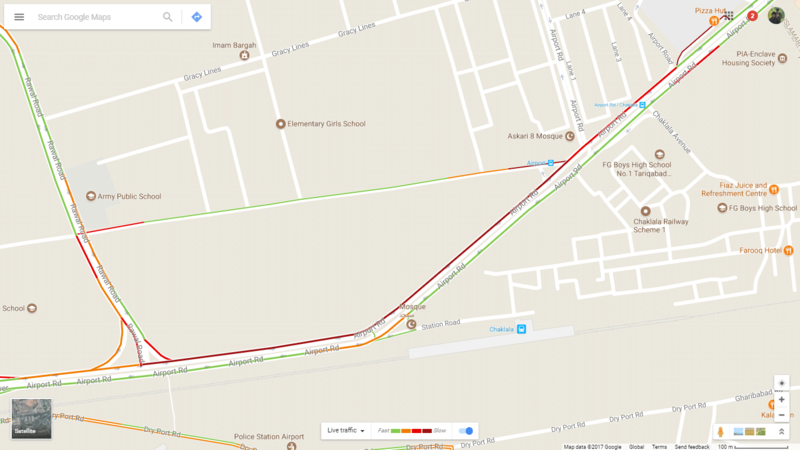 i was just letting the author know that traffic jam shown in google maps picture is nothing if compared with our daily traffic jams in karachi. Nothing unusual we cant lay even sewerage line correctly what else you can expect from nation/ institutions except envy.New sewerage line laid in new muslim town lahore block c with storm water channel newly made, they are worse then old one 6 inch water standing in front our homes. most posh area of city.